He is a “switch pitcher”, capable of throwing from either the left or the right hand. And in fact, to hone his craft, over the years he has had a specially produced baseball glove made for him with four fingers and two thumbs, to allow him to seamlessly switch from right to left as the situation warrants. Well actually, two Buffalo TV stations. Such is the fame and celebrity of Pat Venditte, who was signed to the Toronto Blue Jays last fall after being waived by Oakland, and has been assigned to Buffalo’s AAA roster. The ambidextrous Venditte brings a special skill to the playing field, and in fact, one that no player has managed to do in Major League Baseball since 1894. He is a “switch pitcher”, capable of throwing from either the left or the right hand. And in fact, to hone his craft, over the years he has had a specially produced baseball glove made for him with four fingers and two thumbs, to allow him to seamlessly switch from right to left as the situation warrants. 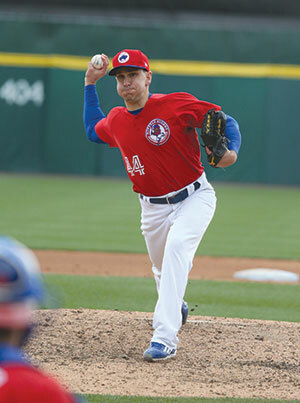 A true switch pitcher: Pat Venditte pitches with his right hand. 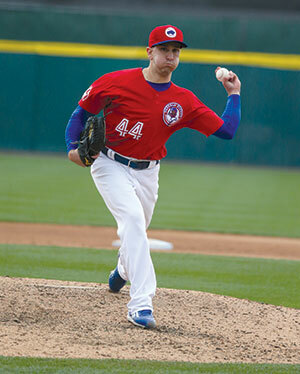 Photo courtesy Buffalo Bisons. “Well not that seamlessly,” Venditte laughs as he poses with his glove on a sun drenched practice afternoon at Coca Cola Field. “When I first started professional baseball it caused quite a stir”. The MLB rules committee eventually caught up with the situation, and in 2015 adopted Rule 5.07(f), which in essence states that a pitcher must indicate to the umpire which hand he intends to use when every batter steps up to the plate, and then the batter, if a switch hitter, gets to select what side of the plate to swing from. The pitcher can not change hands during that at bat unless an injury prevents him from using the original hand. It has been named “The Pat Venditte Rule”. Pat Venditte pitches with his left hand. -43 year old pitcher Bartolo Colon of the New York Mets, known best here in Buffalo as having thrown the only no hitter for the Buffalo Bisons in Coca Cola Field history back in 1997, can now add another accomplishment to his storied repertoire. This past Saturday he hit his first ever career home run.